On a whim, my fiancé and I went to dinner at Dinosaur Barbecue in downtown Rochester last week. After finishing an absolutely phenomenal meal from which we both wanted to roll home, we walked to the car across the Court Street Bridge. 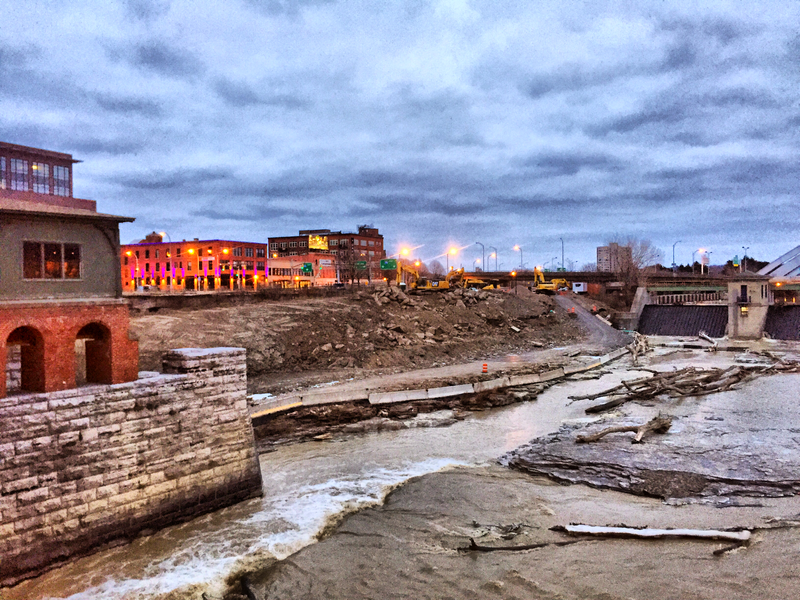 Before getting in the car, I stopped, turned around and took a photo of a construction site straddling the Genesee river. This site marks the start of construction on riverside condos and a scenic walkway that will connect the Genesee River Trail and Downtown Rochester. The project will be the first of many in Rochester’s attempt to reclaim the now unattractive shores of the city’s central waterway. But as with many development projects, there is another story to this seemingly all-positive addition to our urban revival. The endeavor will essentially seal off the main entrance to the former Rochester Subway tunnel, which has become a bit of an attraction for photographers, graffiti artists and curious adventurers. Besides being an urban explorers dream, many preliminary development ideas have been introduced for this space, ranging from a below-ground park (think of The High Line in NYC, but underground) to a major retail and restaurant space. The appeal of this space is that it exists in a former aqueduct, where the Erie Canal once traveled over the Genesee river. From the 1920s-1950s it was turned into tunnels for the Rochester Subway. Today, a little less than a mile of this tunnel still exists, the most attractive part being the section seen above and below that still crosses over the Genesee River under Broad Street. The aforementioned riverfront development project will jeopardize the future of this urban playground as well as the possible opportunities to develop this key piece of Rochester’s rich history. The subway tunnel is a truly unique structure, the likes of which cannot be found anywhere in Upstate New York. Travel two hours East to Utica, New York, and find a similar controversy over whether or not to build a hospital downtown, a reality that would see the destruction of a large group of older buildings, most now vacant. One side promises a hospital with more jobs and more foot traffic for a growing downtown, while the opposing #NoHospitalDowntown movement leads a charge against the demolition of buildings that could become a future local development space for offices, housing, restaurants and retail, among other arguments. For the record, The Urban Phoenix does not support or condemn either of these viewpoints. These often heated conversations are happening everywhere as urban revival sweeps across the nation, and with this in mind, it is a vital necessity to have these conversations. How much “new” development should a downtown area adopt? Is it space that will truly benefit the local economy, or is it a silent money drain that will line the pockets of outside investors? How long should a city hold out in the hopes of local development of an area before allowing the bulldozers to roll in? How does a city blend the “shop local” movement with the occasional need for outside financial influence, or even the dreaded “big box” store? These are the hard questions facing our growing urban areas today. It seems so easy to talk about condos and a waterfront walkway, or a hospital that creates jobs as a positive, until you look at the possibility that these may actually inhibit more beneficial long term growth. When residents demand immediate action to help bolster their communities, it’s difficult to tell them to be patient when a “here-and-now” solution is knocking on the door. Walmart is the premier example of “subtraction by addition,” rolling into small towns and promising jobs, when in reality, most of those jobs pay far below a sustainable wage. Furthermore, eventually Walmart negatively effects local economies… while you might save a buck or two in your weekly shopping, their low prices make it nearly impossible for local retailers and supermarkets to compete, putting businesses generating vital local revenue out of business altogether. Big box stores play a role in our economy, but when considering local development, these companies should never been seen as paths to socioeconomic success. As for a downtown hospital that displaces existing structures? The data is mixed. In many cases, these projects have injected life into downtowns across the country. In other areas, they have had the opposite effect. The key is in the details of implementation, and this is where local leaders and citizens need to be vigorously informed. So often with these conversations, we teeter on the often fine edge between “Urban Revitalization” and the dreaded “Urban Renewal,” the mid-twentieth century movement that resulted in the demolition of entire neighborhoods to create housing project and one-dimensional office buildings across the United States. As with everything, these issues can be confusing for you the resident of a growing urban area. There is a feeling that once the decision is made, a city cannot go back. It is vital for all of us to welcome those projects that utilize existing structures, and critically question those projects that plan to remove them. They key, as always, is to stay informed… speak to proponents of both sides and listen to the facts. Use online resources to see if this issue has been addressed elsewhere. The only way to make the right choice in these matters is to continue to educate ourselves. And you know what? The learning experience almost always leads to a sense of ownership of our cities and our neighborhoods. We can all feel like we have a little voice, or at least understand what all the voices are saying. After all, the greatest resource a city has isn’t a subway tunnel, a condo, a hospital or a collection of buildings waiting to be developed… it is an intelligent, resourceful population of people who are actively invested in their community’s future.